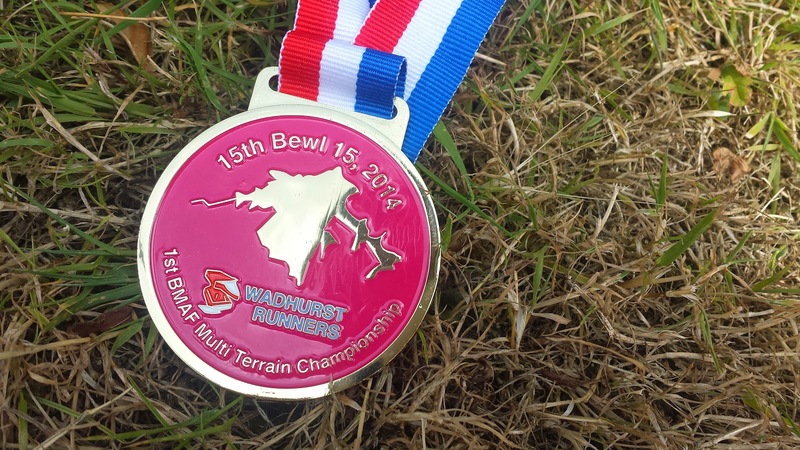 The Bewl 15 mile race is hosted by Wadhurst Runners and takes place on the trails and roads around Bewl Water Reservoir, which straddles the Kent-Sussex border. I've had this on my list of races to do for a few years, but due to other commitments had always missed it. 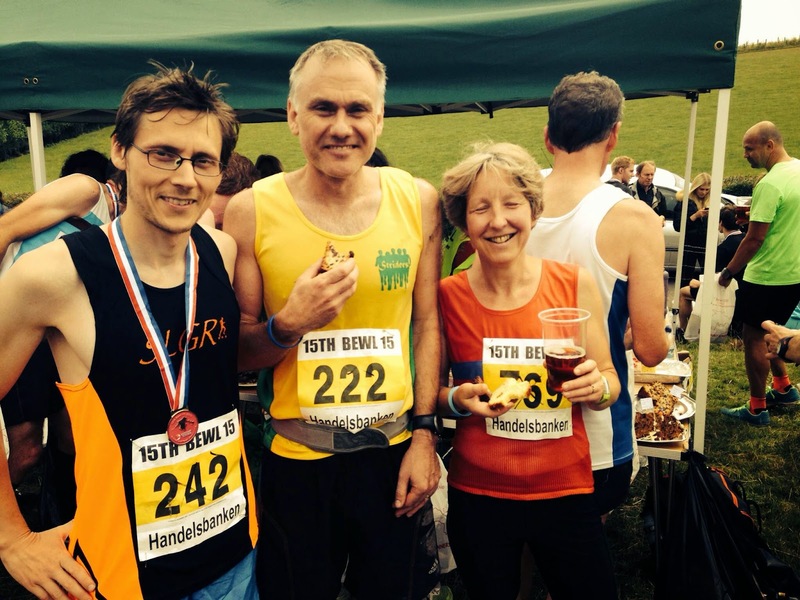 This year was different, and despite taking place only two weeks after the North Downs Run, I submitted my entry. I was unaffiliated at time of registration so I registered as an unattached runner and paid the full £22 Registration fee - I did of course run in my black and orange So Let's Go Running vest on the day. A few weeks before the event, I received my race pack in the post – this contained my number, timing chip, and the race day instructions. Email communication was good with a hugely detailed email being sent out by race management company, Nice Work. This was followed up by an email from race director Albert Kemp on the evening before the race with an update on course conditions. Upon arrival on Sunday 6 July 2014, I parked at the race headquarters, which was at the Uplands Sports Centre, in Wadhurst. 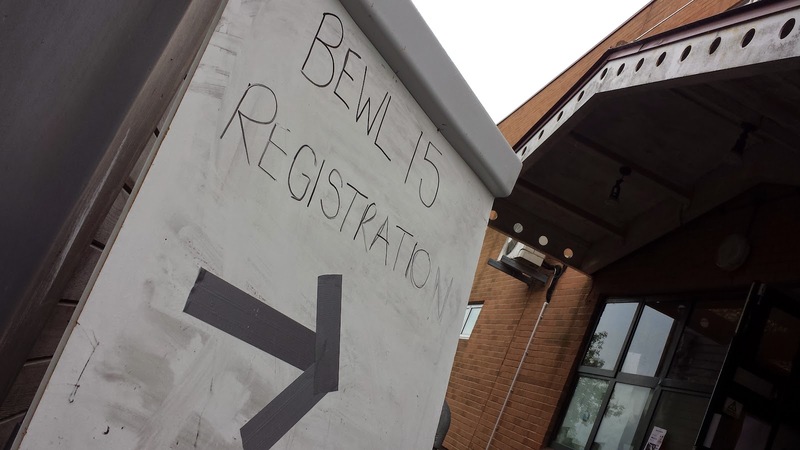 I wandered over to the main sports hall where on-the-day registration was still possible. Other runners were having a pre-race massage. 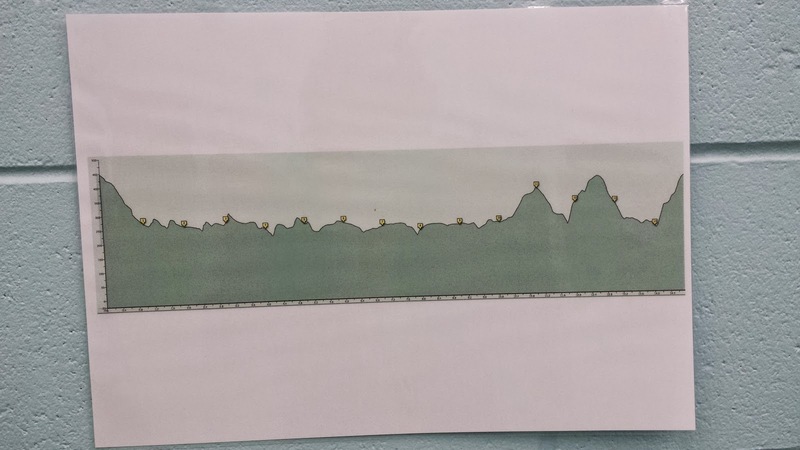 The walls displayed maps of the route and the hill profile. The facilities consisted of the main permanent toilets within the building and also four portaloos. There was also an open grass playing field which provided a good space for warming up. At 10am a bagpiper lead the march from the race headquarters, over to the start/finish area, which was a few hundred metres away. The runners filed into appropriate positions within the main start area. 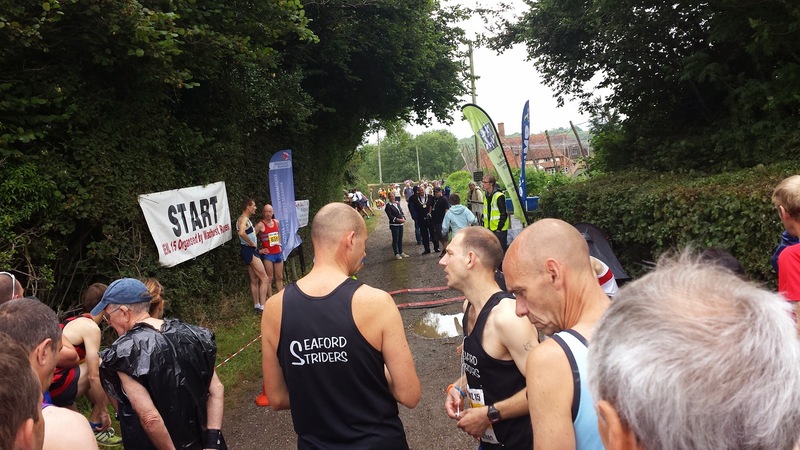 The race also incorporated the 'First British Masters Athletics Foundation Multi-Terrain Championships', and runners taking part were given priority at the front of the pack. 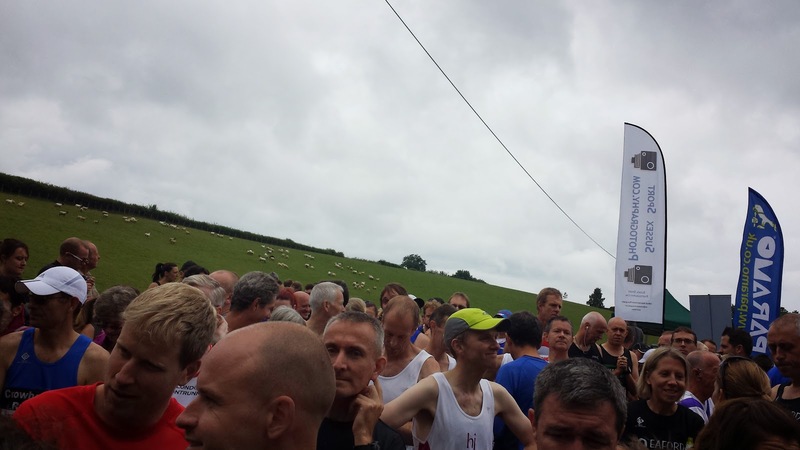 The race start time was 10.30am, and right on time a klaxon sounded signalling that it was time for us to head off on our 15 mile journey around Bewl Water - created in the 1970s to increase the supply of water to the local area, containing 31,300 million litres of water, it is the largest body of inland water in south east England. The path at the start of the race is quite narrow for the amount of runners trying to squeeze through and it took about 20 second to reach the start line. The opening stretch features a 1 mile descent down to the level of the reservoir, which ends in a tight squeeze and bottleneck through a small gate. It was rocky and uneven in places so care was required in order to stay upright as the 684 strong crowd of runners went hurtling down. I had met up with fellow Riddlesdown parkrun regular, Graeme Drysdale (his account of the day is here), and we set off together. By the time I reached the bottom of the path, I had a small stone lodged in my left shoe. Every footstep I took it moved around under my big toe. I attempted to ease it to the side but it kept coming back, sometimes giving me a sharp shock as I pushed off the ground. The question was ‘should I stop and remove it, or should I push on?’ For now the answer was ‘push on’ and hope that it would somehow find a less painful spot to reside. 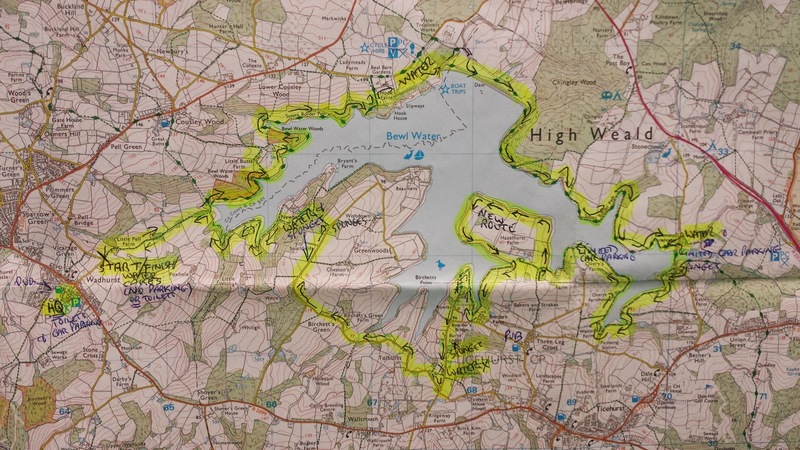 Once the route reached its lowest point, it was time to start the 13 mile lap of the reservoir. After the first couple of kilometres, me and Graeme’s paces had spread us out and I wouldn't see him again until the end. The first 10 miles of the course are the flattest, but there are still undulations to deal with. The terrain is largely forest trail and was pretty uneven in places throughout the entire race – I found this put quite a bit of strain on my ankles and calves. There are views of the reservoir every now and then, but not as many as I had imagined. The weather conditions could not have been better. It was cloudy, with the odd sprinkling of light, refreshing rain. The temperature had dipped a little from the recent summer highs. I found this to be very comfortable throughout. The ground was largely firm underfoot. However, a few downpours in the 24 hours before, and on the morning of the race has made some sections of the paths wet and, in places, a little slippery. I had brought 5 different pairs of running shoes with me, and decided to go with my trusty old Adidas Kanadia TR3 trail shoes, which was the correct decision. After running across trail, grass, and tarmac, and over stiles and through gates, I finally reached the 10 mile point. This is significant because this is where the proper hills kick in. The hills are mostly, but not exclusively, on tarmac roads. It was in this final third of the race that the marshals with buckets of orange segments became my heroes. Of course there was also the water stations and sponge stations – all well staffed. The water was given out in bottles which made it easier to sip and carry as I ran along. 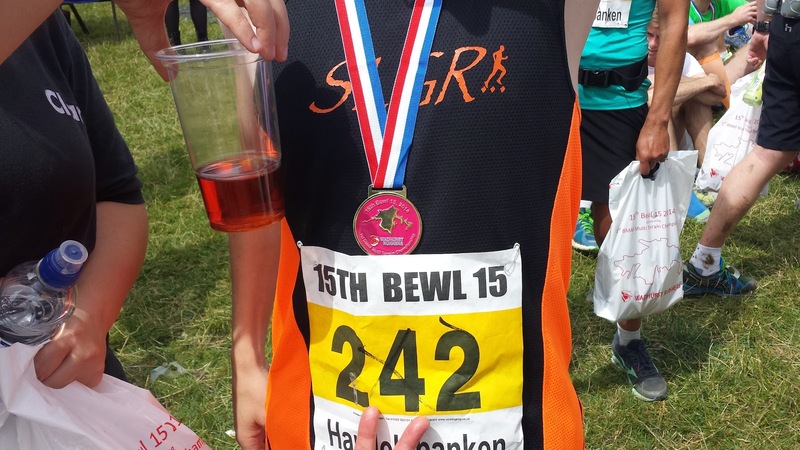 The Bewl 15 has a special way of awarding finishing medals. Instead of giving everybody the same medal, here at Bewl the type of medal you receive is based on your finishing position; the first 100 runners across the finish line are given a gold medal, runners finishing in positions 101 to 250 receive the silver, and everybody else gets the bronze. What a brilliant idea! However, that brilliant idea made me eager to attempt to finish in the top 100. By the way, the stone in my shoe was still annoying the hell out of me, but with my sights set on the gold medal, I didn't want to risk losing precious places in order to sort it out. I was running pretty much as hard as I could given the course. One of the uphill sections reduced me to walking pace, so I used it as an opportunity to properly take on some fluids. The downhills were steep and felt like they were taking more out of my legs than the uphills. Then the final downhill section was over and all that was left was to run back up the rocky and uneven path that I had come down at the very beginning. I was hoping that I would be in the top 100, but in all honesty I had absolutely no idea how many people were in front of me. The last mile climb to the finish was hard but manageable. About 400 metres from the end one of the other runners started to talk to me. I acknowledged him but was more concerned with using any breath I had left to stay ahead rather than to chat. Then the finish line was in sight. I crossed it, slowed down and collected my shiny GOLD medal. I had finished in 82nd position - inside the top 100, but only just. In fact, I was only 97 seconds ahead of the 100th placed finisher. It was all so very close at the end! Post run I headed across to the post-race area where I found a goody bag, lots of cake, more water, beer, and the bespoke technical race t-shirt. So often race t-shirts are way too big for me, so I was pleased that they had such a good selection of sizes. I took an extra small, which is a nice snug (but not tight) fit. There was also a brass band playing and a selection of other gazebos offering massages etc. During the day, I bumped into some familiar Riddlesdown parkrun faces, including the main core team of Nicki and Ange. I also saw a few runners that I recognised from other parkruns and other races. I was even recognised and complimented on blog7t.com again (this is happening more often these days) - thank you. After a few slices of vegan cake, a few photos and many a tale of mid-run incidents (I hope your shoulder is ok, Graeme), it was time to head back over to the main headquarters to find the car and finally remove that damn stone from my shoe before heading home. I had a great time running at this event. It was a great mixed-terrain (mostly trail) run and it's definitely one to do. The added bonus of getting the gold medal really made my day. The official results appeared online later in the day and my chip time was 1:49.42 - not bad for an undulating/hilly trail 15 miler. I must have crossed the half-marathon point in about 1 hour, 35 minutes or so. If GPS data is your thing, you can analyse mine (or just check out the course in detail) here. I was quite impressed with myself for maintaining a pretty even pace throughout. The only km split that was over 5 minutes was when I had a brief walk. Maybe I should have kept going!